Are you familiar with Mannitol salt agar (MSA)? Have you ever used Mannitol salt agar in your laboratory? If you have used it, but don’t remember why and when, than you are in right place. In this post I am discussing about MSA, its composition, uses and the colony of characteristics of organisms that grow on MSA. Remember this statement: Mannitol Salt Agar (MSA) is a selective, differential and indicator medium which is used to isolate and identify Staphylococcus aureus from the clinical specimen. Mannitol (1%): Mannitol is one of the major ingredients. Do you remember what is Mannitol? It’s a sugar. Salt (7.5%): Salt is the common ingredient but see the percentage, which is very high compared with other media. Agar: the medium contains agar (a solidifying agent). You can purchase prepared Mannitol Salt Agar from the commercial suppliers or get the Mannitol Salt Agar Powder and prepare the media in your laboratory. Mannitol salt agar is best prepared from ready to use dehydrated powder, available from most suppliers of culture media. The medium is usually used at a concentration of 11.1 g in every 100 ml distilled water (concentration may vary depending on manufacturer). Prepare the medium as instructed by the manufacturer. Sterilize by autoclaving at 121oC for 15 minutes. When the medium has cooled to 50-55oC, mix well, and dispense it aseptically in sterile petri dishes. Date the medium and give it a batch number. Store the plates at 2-8oC preferably in plastic bags to prevent loos of moisture. Shelf life: Several weeks providing there is no change in the appearance of the medium to suggest contamination, deterioration, or alteration of pH. pH of medium: This should be within the range of pH 7.3 to 7.7 at room temperature. So what’s the purpose of using salt in Mannitol Salt Agar? Why Mannitol (Sugar) is used in Mannitol Salt Agar? Whenever there is the use of any sugar in any media used in Microbiology, we try to find does a particular microorganism is able to ferment sugar present in this media or not? For example, in MacConkey Agar we try to find, does a gram negative rod is lactose fermenter or not? In TCBS, we try to identify the isolate on the basis of sucrose fermentation. Vibrio cholerae is able to ferment Sucrose and gives yellow color in TCBS. Similarly in MSA, we try to find does a particular organism ferments Mannitol or not? You must be aware by now; all the staphylococci spp are not pathogenic to human. So, next task of microbiology laboratory (microbiologist) is differentiating S. aureus from other Staphylococcus spp. Pathogenic staphylococci, i.e. Staphylococcus aureus is able to ferment Mannitol (It is coagulase test positive) but others (coagulase negative Staphylococcus) are not. So, if that particular specimen contains S. aureus, it ferments Mannitol (whenever sugar is fermented acid is produced) and changes the pH of medium to acidic. As MSA contains phenol red as a pH indicator, at pH levels below 6.9, the medium is a yellow color. But if Coagulase negative staphylococcus (CONS) grow, they cant ferment Mannitol, so the color of the media around the bacterial colony does not change to yellow, it appear pink. # Note: Staphylococcus saprophyticus (coagulse negative Staphylococcus) may ferment mannitol, producing yellow halo around colonies in MSA thus resembling with S. aureus. So, MSA is also a differential medium. Remember that in the neutral pH (6.9 to 8.4) the color of phenol red is red; while above pH 8.4, the color of phenol red is pink. Note: Other commonly used media that contain Phenol red as pH indicator are; TSI Agar, Urea base agar and XLD Agar. Staphylococcus aureus: Yellow colonies; may have yellow halo around colonies. Enterococcus faecalis and Enterococcus faecium (most common enterococcal species that has been isolated from human infections) are salt tolerant bacteria. They can ferment mannitol and produce lactic acid, producing yellow colored colonies on MSA. Catalase test can help to differentiate between Enterococcus (-ve) and Staphylococcus (+ve). It is best source for microbiologist to learn everything about media & its composition. As you might have already know that all yellow colonies in Mannitol Salt Agar is not given only by Staphylococcus aureus but also by other salt tolerating, Mannitol fermenting bacteria. So some simple tests like Gram staining (to see typical gram positive cocci in cluster) and coagulase test are always helpful to confirm that the isolate is S. aureus. Read troubleshooting above again. We’ve tried to grow an unkown in MSA, does klebsiella grow on MSA? We have contaminants growing on some portions of the MSA, bigger colonies doesn’t exhibit fermentation, smaller colonies did. We use MSA for special purpose only, to differentiate S. aureus from other CONS and/or while screening presence of S. aureus in anterior nares of health care professionals. So far, we have not isolated Klebseilla from MSA. MSA is supposed to inhibit gram negative bacilli. To identify the isolate, please follow the basics. Perform Gram staining. Culture in Blood Agar and MacConeky Agar. Choose further tests on the basis of Gram Staining and Culture reports to identify the isolate. Thank you so much for this article, very well written. 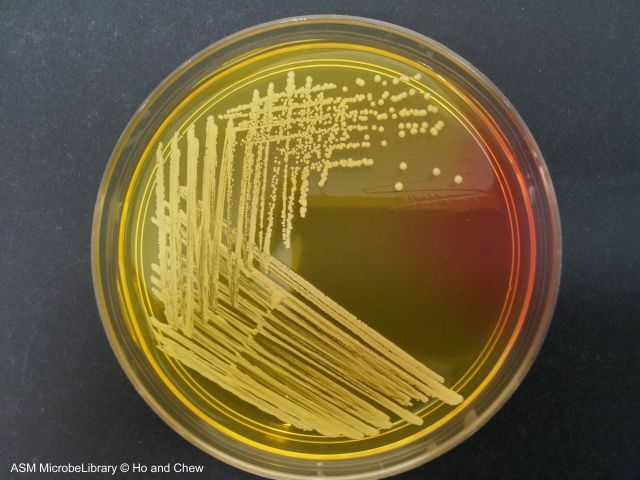 If an MSA plate has mostly yellow colonies (4) and one pink colony can this mean that there are two types of bacteria growing? For example Staph aureus from the infection site and maybe Strep epidermidis that was normally part of the patient’s microflora and is harmless? Marianna, thank you for the comment. It may be Staphylococcus epidermidis, not Strep epidermis. Please perform Catalse Test, Coagulase Test, Gram Staining to identify the isolate. Staphylococcus epidermidis is the normal skin flora and when the sample is swab (not pus), skin contamination is likely to occur while taking the swab. How to prepare mannitol salt agar. Utibeabasi, thank you for the comment. Please go through the blog post, it is now included there. What two factors does the Mannitol Salt test indicate about a microbe if the test is positive for both? Sorry failed to understand your query. Can you rephrase and post the query again? If we directly use MSA For isolation of Staph spp beside S.aureus,will all spp of Staphy grow? Anum Saeed this is a question that would help me also but I do not see a response. yes, as far i know clinically relevant species of Staphylococcus grows well in MSA. In clinical sample our concern is mainly with 3 species, S. aureus and CONS (S. epidermidis & S. saprophyticus), all of them grow well. If you want to know about any other particular species, please let me know, i will try to help whatever i can. Thank you for the information. What’s the principle of yellow colony and medium made by coagulase-positive staph? It’s due to mannitol fermentation as far as I understood. But some say if staph is coagulase positive, it makes yellow colony and surrounding yellow medium. Does coagulase make staph ferment mannitol? no.. Is there any relationship between these? or just is it coincidence of features of S.aureus who ferment manntol and is coagulase positive as well? I have Staphylococcus isolates that grew very well and turned the color yellow on MSA plates, but the VITEK test showed that they were S. saprophyticus !! how can this happen?? in this case how can I differentiate S. aurues from other Staph. species on MSA ?? . Does micrococcus grow on MSA?? Yes Micrococcus can grow on this media. It contains a high concentration (about 7.5%-10%) of salt (NaCl), making it selective for Gram-positive bacteria (Staphylococcus and Micrococcaceae). Can a Micrococcus ferment mannitol? and why is there gas in a durham tube but no color change? Can this be the result of Micrococcus? lastly can Micrococcus ferment any sugars at all? thank you for this article, it is very informative for me and my colleagues. I want to ask if Gram negative bacilli can grow on MSA ? we had cultured an unknown wound swab on MSA the colonies are very faint. when we performed Gram stain it was Gram negative bacilli. it really made me confused . please answer me. It’s very informative post.thank you so much for it.I have a question. I’m a research student and my work is isolation of staphylococcus from human skin, for this purpose I use MSA to culture staphylococcus species but I m very confused to identifying then. I mostly find yellow, mucoid, sticky, shining, colonies and after gram staining it shows small team positive cocci.some in culstures and some diplococci.kindly guide me what should I consider them ? What test should I perform to differentiate them, because after reading this artical I’m confused these are sthaplocooci or micrococci? Plz sir reply me asap. Thank you very much Acharya. This information was very helpful to me.